Chaired by the General Secretary of Mali’s Ministry for Equipment, Transport and Development, a representative of the European Union delegation in Mali, the Director General of IGN FI, the Director General of the Geographical Institute of Mali (IGM)) and the Mayor of ‘Commune 3’ which hosted the event, the seminar brought together over a hundred participants (with around 400 people attending the ‘Universities/National Engineering Schools’ seminar held on September 26th). Guaranteeing the transfer of a complete range of skills to personnel thanks to support from the Technical Assistance provided. This reference system shall constitute the foundation for production work on thematic data by the various institutions in Mali. 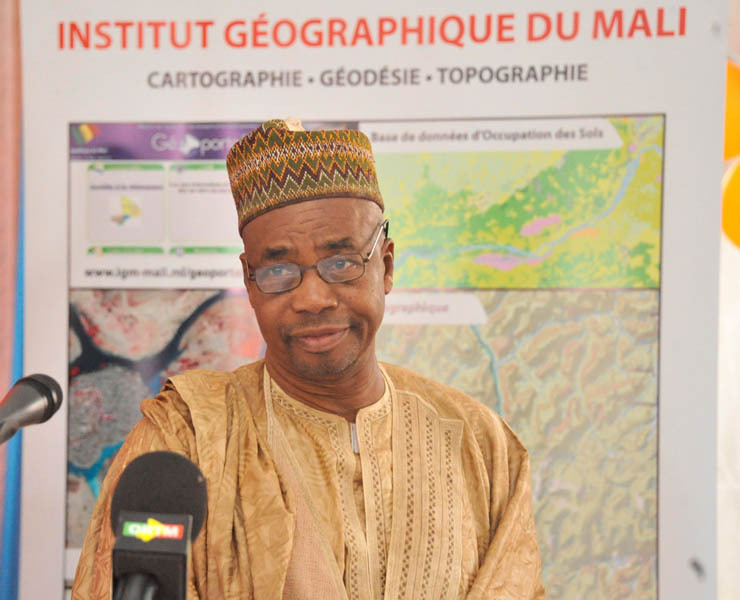 After four years’ work, this project to rework Mali’s 1:200,000 scale maps officially comes to a close on September 29th 2016 and a national seminar will be held for the occasion. Each of the project’s technical components was covered in detail during the various presentations given throughout the day and the key factors for the project’s success were highlighted as well as the difficulties encountered. The solutions found to address these problems were also described and analyzed. Another issue widely discussed over the course of the day was the availability of data produced and its use with the participation of representatives from the National Directorate for Regional Development and Army Chiefs of staff who showed how the production of this up-to-date information in digital format would help them in their daily work. Lastly, IGN FI’s Director General Christophe DEKEYNE took the floor in the second part of the seminar to give a detailed explanation of the role of mapping institutes in the country. In this way, he showed that despite the existence of internet in the modern world with its many geospatial applications, institutes still play an essential role in producing and sharing the reference data needed by countries to ensure their economic development and the long-term sustainability of the investments made. He illustrated his point by giving several examples of countries that have already created such entities and others that have no such structure and are currently going through the process of creating fully operational geographical institutes. “The creation of a geographical institute in a country must not be seen as a cost but rather as an investment for the future. It is the guarantee of obtaining reliable, good-quality data that is regularly brought up to date. Such an institute therefore guarantees countries that their public finances will be protected thanks to projects that are better designed in their initial stages and to the geographical data produced, data which comes at a price but whose value is enhanced when made available to users”. The day was rounded off by presenting some of the practical applications possible in an exhibition which attracted much interest. IGN FI has become specialised in projects based on the transfer of skills. The company’s success has already been proven expertise in this area on similar projects in Senegal and Burkina Faso, where production work was also carried out locally.